If you know me, then you know I LOVE deviled eggs! 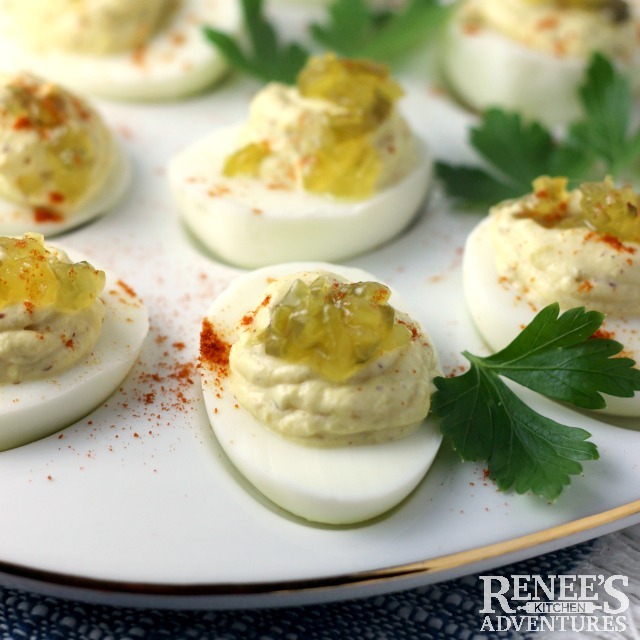 These Sweet Relish Deviled Eggs are now at the top of my favorite list because deviled eggs with relish rock! Sweet relish gives them a nice crunch and unexpected sweetness you will love. My Secret Recipe Club blog assignment this month is Pale Yellow. Pale Yellow is a blog written by Tracy Byrne a former mid-western girl living in NYC. Tracy's blog is full of decadent and beautifully crafted and photographed baked goods, cocktails and more! Trust me, once you start browsing through her extensive recipe index, your mouth will be watering! For this reveal, I really thought about pulling out the kitchen-aid mixer and baking up her over-the-top Man Whore Bars (LOVE the name!) or her Pumpkin Bundt Cake with Cream Cheese Frosting (perfect for the ever popular "pumpkin season" we are in the midst of right now. But, as I scanned the recipe list my eyes were drawn to these deviled eggs with relish. Because, I LOVE deviled eggs so much that I'd be willing to swap the chance to make a decadent treat for a savory one! Tracy used the baking method to make the hard boiled eggs for this recipe. I, however, used my little egg steamer. Ever since I purchased my little egg steamer, I don't feel like boiling and peeling eggs is a chore anymore. It makes perfectly hard boils eggs in minutes and allows the shells to slip right off when peeling. So, since I love deviled eggs so much and my egg steamer takes the work out of making them, I find myself making them more than just for holidays or parties these days. Sometimes I make them and keep them in the fridge to snack on. And, can we talk perfect game day food? I do love classic deviled eggs, but also think it's fun to play around with flavors and textures! 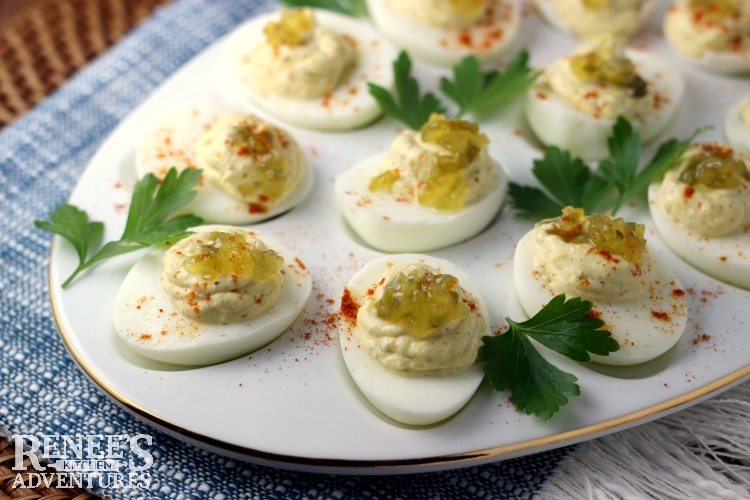 These yummy Sweet Relish Deviled Eggs add a new dimension to the classic deviled egg. My family gobbled these deviled eggs with relish right up in a day! I can see these eggs making an appearance on my holiday spreads this year for sure! Thanks Tracy for this great recipe. I'm looking forward to visiting your blog again and again for more recipe inspiration! 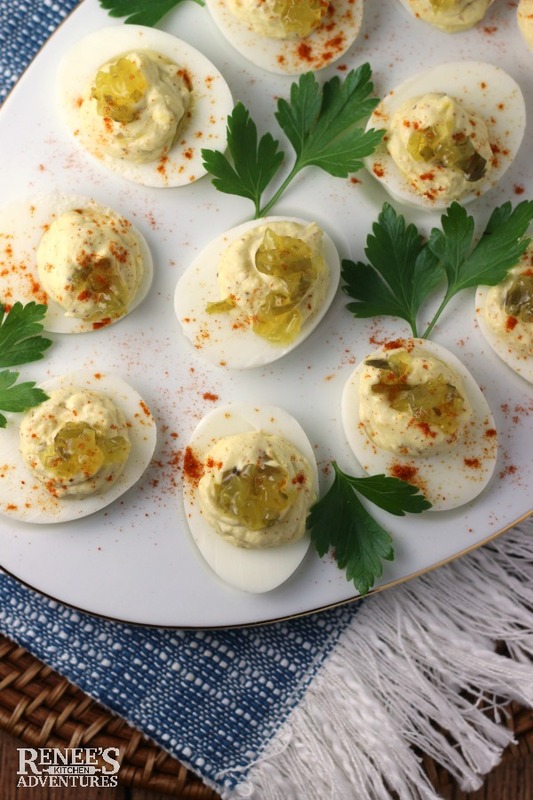 Classic deviled eggs kicked up a notch with sweet pickle relish for a crunchy, sweet twist. Cut each egg in half longways, then scoop out yellow parts of the eggs from the whites and put into a medium bowl. Lay egg white halves, hole side up, on a platter. Mash the yellow parts of the eggs with a fork, until they are fine crumbs. Add to the yellow parts, mayonnaise, sweet pickle relish, lemon juice, Dijon mustard, Stir to combine. Season with salt and pepper, to taste. Put mixture into a small plastic baggie and clip the end to pipe. Pipe mixture into egg whites and garnish with more relish and paprika, if desired. Deviled eggs are delicious! Great SRC selection. We love deviled eggs, too. I have got to do more reading about your egg steamer. Easy peel?!? Yes, please. Oh I love that thing!! It's a GoDash steamer and it seams 6 eggs at a time. You pierce a small hole in the bottom of the shells (it comes with a tool for this) and I think the steam gets between the shell and the membrane when it cooks. A quick ice bath once the eggs are cooked and the shells slide right off...every time! It must be a midwest thing....I thought everybody put sweet relish in their deviled eggs! I am totally craving these right now - I know what I'm doing tonight!! Oh yes, these are the deviled eggs of my childhood. Hubby doesn't eat deviled eggs, so I rarely have them. These look so good. Happy Reveal Day. Nice twist on a classic. Looove deviled eggs! They look great!